Reserve Hunting Hollow Haven Today! We come to Gatlinburg/Pigeon Forge every year and ALWAYS use Cabins USA. We were thrilled with this cabin. A perfect place for fun activities downstairs and privacy upstairs. Beds were very comfy and loved having 3 bathrooms. We had just about everything we needed except maybe more trash bags and laundry detergent. Parking isnt easy or plenty but the location is very private and still close enough to town. We will surely return. Hunting hallow haven is a beautiful location. The cabin was amazing. We definitely enioyed the game room. The beds are all comfortable and their were plently of linens. After seeing a few previous reviews of this cabin I was wondering about the road up to the cabin, but it was fine. It is a gravel one lane road, which made it interesting when a car was coming from the opposite direction. Few things I would recommend that needs some work. The lighting in the main living space was not great. We needed to move a lamp or two from another bedroom. Each room has a dvd player and there is cable in the living room, upstairs bedroom and game room. We could not get most of the dvd players to work. Two big cons was the amount of trash outside the cabin, and the fact that the cabin does not have internet or a landline. I have Tmobile and did not have service at the cabin. I ended up purchasing a Verizon Hotspot and it did what we needed. Overall we were very happy with our stay. Very nice cabin. Way back in the woods!!!! We thoroughly enjoyed the cabin. The location was convenient for Pigeon Forge and Gatlinburg. The 9 for comfort was due to the couches, they desperately need to be replaced. My only other suggestion would be for a rocking recliner. We had a 6 month old and a 2 month old with us and a rocker would have been nice. Thank you. My family enjoyed our four night stay at Hunting Hollow Haven. It was spacious and clean. The beds were made with fresh linens and clean towels were available for us. The kitchen was a little small but was fine for simple meals. Our microwave did not work and I called Cabins USA and they apologized and had a different microwave installed within a couple of hours. Very friendly, polite customer service representatives. The cabin was conveniently located within 15 minutes to Gatlinburg or Pigeon Forge which made it very handy for outings. The parking was a little tricky but we managed. I wish there were internet in the cabin. We had no phone service either so it was impossible to search for locations of restaurants and other activities we were hoping to do. We found ourselves driving to the nearest hotspot to plan our activities which was very inconvenient. No cable in 2 out of 3 bedrooms! The king bed upstairs was wonderful. The other 2 beds were not. My daughter-in-law and i both had a back ache every morning when woke up from the 2 beds on the main and lower level. The furniture is very worn. The couch in the game room had no legs on it! The balconies would have been great except the bird droppings on the furniture. The droppings were very dried out so the mess has obviously been there for some time. The hot tub was nice to soak in while looking at all of the trash and beer cans that previous renters have thrown off the balcony. We enjoyed our vacation but we will not be returning to this cabin. Everything was great just didnt like the steep hills. I drove a mustang and i almost didnt make it up to the cabin. Enjoyed the cabin, was kinda disappointed with no cable in the downstairs bedrooms, and no Wifi other than that everything was great...will be booking again next year. Thanks USA Cabins. First, let me say this was our third time renting from Cabins USA. This is the only time I was disappointed, when we got to the cabin the refrigerator was turned down and wouldn't keep the groceries we had bought cold and upon entering the game room we found the vent hanging down out tof the ceiling and the foosball table leg was broken off and laying on the dryer. I called the office and immediately someone was in our driveway, only to be told the refrigerator would be cold in about eighteen to twenty hours, which meant we had to buy three large coolers to keep our food cold. The guy told us somebody would be out the next morning to fix the game table, we never did see anybody again. This was the reason I chose this cabin, with teenage boys I wanted them to have something to do in the evenings. All this being said, we loved the cabin and will be using Cabins USA to rent again next year just like we have for the last three vacations. We loved our stay at Hunting Hollow Haven cabin. The cabin was clean and arranged perfect for our three couples and two grandchildren. My middle son that was getting married on Saturday, slept on the couch bed in the living room. He said it wasn't very comfortable. This was not a big deal because this was only for one night. The pillows need to be upgraded or bring your own from home. That wasn't a big deal with me because I always travel with my favorite pillow. The bedroom upstairs where my husband and I stayed was nice but tall people beware of the beams in a couple of places. There was a lot of rain the four days we were there and there was a small leak in our bedroom by one of those low beams. We placed a garbage can under the leak and it didn't really bother us. I would suggest to anyone renting a cabin to bring their own washing detergent, garbage bags, paper towels, Kleenex and toilet paper if you plan to stay four or more days. We didn't find any Kleenex. There was plenty of towels and wash cloths. There was pots and pans for cooking and silverware and plates, glasses, etc. We brought paper plates and cups to use which is probably why we needed extra garbage bags. Overall, our stay was great. our stay was awesome, other than gas fireplace does not work. We did miss it, when snowing at night. would have been nice to relax by the fire. However would love to stay again. Hi Jonathan, thank you for your review of Hunting Hollow Haven. We wanted to make sure you were aware that the fireplace has been repaired. We look forward to seeing you again soon! If you are looking for an isolated cabin, then this is for you. There are only 3 neighbors on the road, which is gravel and pretty steep. Once you get there you will enjoy this three level cabin. A bedroom on each level gives everyone plenty of privacy. The game room is lots of fun and the hot tub looks out on the hollow. Overall we enjoyed the cabin. We found it online & booked within a few minutes for a same day checkin. Nice, secluded area, good space. A few minor improvements I'd like to suggest are 1) install WiFi or internet connection 2) release the thermostat to go higher than 74° (for guest comfortability) 3) if the downstairs TV will only play DVDs, a few should be available as most people don't travel with DVDs. Thank you for taking the time to let us know about your recent stay in Hunting Hollow Haven! We here at Cabins USA work hard to make sure each of our guests have the best stay possible while vacationing in the Smokies. When you are ready to stay with us again, please mention you are a return guest for an additional discount. Thank you for choosing Cabins USA and we look forward to having you as our guest again! I love booking with Cabin USA I have been booking with y’all for years . We enjoyed our stay at Hunting Hallow Haven ! Only down fall is the drive way there is no room for a big F150 and another car trying to move them around is a bit of a headache.. and I don’t understand why their is tv in the upstairs bed bedroom but not in the master bed or bottom bedroom . It could use more pots and pans the crock pot had no bowl to go in it . I also wish the stuff could tell you more about the driveways and parking in some of these cabins . Best vacation we've been on. The cabin was secluded like we wanted. Everything worked perfectly. We will definitely be coming back. Love booking with Cabin USA, the cabin we stayed at was Hunting Hollow Haven. It was great! We had a minor TV issue, but called the office and they took care of it very quickly! This Cabin is Wonderful, except for the distance away from everything, it seems like it takes forever to get somewhere from the cabin because of the curvy roads. All in All in was a great trip and another great experience with Cabins USA! Thank you for taking the time to let us know about your recent stay in Hunting Hollow Haven! We here at Cabins USA strive to give each guest the best stay possible while vacationing in the Smokies. When you are ready to stay with us again, please mention you are a return guest for an additional discount. Thank you for choosing Cabins USA and we look forward to seeing you again soon! Absolutely loved our stay in your cabin! Loved the seclusion of the cabin! Also the cabin was very clean! We will definitely stay here again. Thank you for all of your kind words! We here at Cabins USA strive to give each of our guests the best stay possible while vacationing in the Smokies. When you are ready to stay with us again, please mention you are a return guest for an additional discount. Thank you again for your review and thank you for choosing Cabins USA! Location was fantastic! 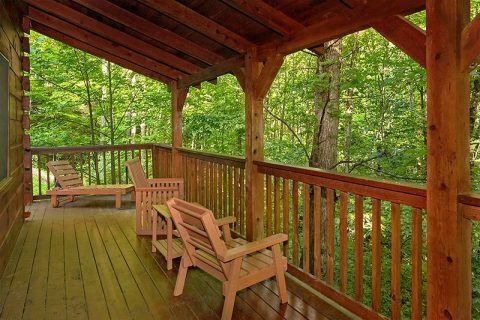 Secluded yet close to Pigeon Forge, Sevierville and Gatlinburg. The road to the cabin is a little scary at night but manageable if you drive it for the first time in the daylight. Express check in was great. Arrived to our cabin shortly after 4pm and had no issues. Very pleased that we didn't have to go into town to check in. Express check out was nice, however, would have liked confirmation that our text was received when we left. Called the office a couple of times to ask questions but had difficulty reaching anyone. Most times was prompted to leave a voicemail. When I did reach someone she was extremely helpful and friendly. The cabin was nice and very clean, however, some of the amenities are a little outdated. The furniture and bed linens could use an upgrade. The downstairs couch has a board under the cushions to keep it from sinking. Would recommend offering wifi since there is no LTE or 3G service at the cabin due to the location. Overall, had a wonderful stay! Great for families! Would highly recommend Cabins USA, as well as this cabin. I am so happy to hear that everyone enjoyed their stay in Hunting Hollow Haven! We here at Cabins USA strive to give each of our guests the best stay possible while vacationing in the Smokies. Thank you for all of your suggestions. Your comments have been forwarded to our Owner Liaisons who will be bringing these to the owner's attention. Thank you for choosing Cabins USA and we look forward to having you as our guest again! This place definitely exceeded my expectations. The check-in and check-out process was so easy! I even missed my early check-in window and with a simple email, the documents were resent and I was able to check-in online- even late! The cabin itself was clean, updated, and so cute! I will definitely be back. Thank you for all of your kind words! We here at Cabins USA strive to give each guest the same great stay you enjoyed while vacationing in the Smokies. When you are ready to stay with us again, please mention you are a return guest for an additional discount. Thank you again for choosing Cabins USA and we look forward to seeing you again soon! We loved the cabin! It was comfortable and had everything we needed. The kids as well as the adults had lots of fun in the game room. We enjoyed having breakfast at the cabin as a family each morning before heading to see the sights. Cabins USA was wonderful and we will definitely use the company again. Thanks for a great vacation! I am so happy to hear that everyone enjoyed their stay in Hunting Hollow Haven! We here at Cabins USA work hard to make sure each of our guests have the best stay possible while vacationing in the Smokies. When you are ready to stay with us again, please mention you are a return guest for an additional discount. Thank you again for your review and thank you for choosing Cabins USA! We enjoyed our stay very much! Our kids loved it! The first few days we went to town and did some shopping and adventuring and they begged to go back to the cabin. We finally had to just plan a day of staying in. The cabin is about 13 mins from pigeon forge. Not bad at all. The only thing I would suggest is to make sure you arrive the first time to cabin during day light. The drive up to cabin is a bit scary the first time in the dark. But non the less made for a good memory my kids will never forget :) We can't wait to come back this summer! I am so happy to hear that everyone enjoyed their stay in Hunting Hollow Haven! We here at Cabins USA work hard to ensure each of our guests have the best stay possible while vacationing in the Smokies. When you are ready to stay with us again, please mention you are a return guest for an additional discount. Thank you again for your review and thank you for choosing Cabins USA! Perfect weekend getaway! The only problem we had was the refrigerator door didn't want to stay closed so we put our cooler infront of it to keep it shut. We reported it to the office as we checked out. Oh and the bedroom TV's only played dvd's so we couldn't watch directv in the bedroom. I am so happy to hear that you enjoyed your stay in Hunting Hollow Haven! Thank you for letting us know about the refrigerator door. I am happy to report that issue has been corrected. When you are ready to stay with us again, please mention you are a return guest for an additional discount. Thank you for choosing Cabins USA and we look forward to having you as our guest again! My family and I stayed in Hunting Hollow Haven for 4 days. The layout of the cabin is really nice and the the downstairs game room was great for the kids( and the adults.) However, this cabin could use some upgrading. No wifi, the couches are in need of being replaced. ( I say this because the downstairs couch has a piece of plywood under the pillows to keep the pillows from falling in.) There is a leak in the ceiling coming from the 2nd floor bathroom. We called maintenance and they came out the next day to fix it, but because no one was running the water upstairs I guess they could not find the leak. (even though someone before us had written "leak" with an arrow pointing to it on the ceiling) The location is really close to Pigeon Forge and Gatlinburg so that was a HUGE plus! It was very easy to find with the directions provided by Cabins Usa and the service from Cabins USA was TOP NOTCH! Overall, we had a great family vacation and we would stay here again if the upgrades were made. Thank you for taking the time to let us know about your recent stay in Hunting Hollow Haven! We here at Cabins USA work hard to make sure each of our guests have the best stay possible while vacationing in the Smokies. Thank you for letting us know about the possible leak as well as the condition of the sofa. Those have been forwarded to our maintenance department and Owner Liaisons to be address. When you are ready to stay with us again, please mention you are a return guest for an additional discount. Thank you again for your review and thank you for choosing Cabins USA! We go to Gatlinburg every year and have used several rental companies. With Cabins USA, I believe we have found our home! From reservations to check out they were awesome. The cabin was the cleanest and most organized we have ever rented. Thanks to all that made our stay so memorable. Thank you for all of your kind words! Our cleaners work hard to ensure each cabin is thoroughly cleaned and fully stocked so all our guests have to do is walk in and start relaxing. When you are ready to stay with us again, please mention you are a return guest for an additional discount. Thank you again for your review and thank you for choosing Cabins USA! We stayed at the Hunting Hollow Haven and we really enjoyed this beautiful location. Neighbors below no comment. The cabin was really nice, great game room and fireplace was awesome. Only a couple reasons why we could not give all 10s. Sadly, I needed to have Wifi for just a day or two for work. This cabin does not have WiFi and I had to use Wifi in town. The game room did not warm up like we thought it would, we did not contact Maintenance because the heat was working throughout the cabin it just did not keep the game room and the additional bedroom heated downstairs. The kids enjoyed the game room. No one could sleep in comfort in the third bedroom. Therefore we had to put someone on the couch and someone on the pullout bed because third bedroom was not a good spot to sleep in. We have 3 boys(teenagers) who needed their own bed. We called maintenance to change out lights and to fix a clogged drain. The technician was awesome. He came quickly, checked out the issues and fixed them. I wish I had remembered his name because he was an extremely nice person to come out in the dark and late at night. Overall, this was a wonderful vacation in a beautiful cabin. The express check in and out is a great option. We will use Cabins USA again. Beautiful cabin! We loved the game room ("teen cave") and hot tub. Secluded and quiet but close enough to great hiking trails, crafts galleries, dining, and of course Gatlinburg and Pigeon Forge. We had an issue with the hot tub the second day, and management was very quick to send someone out to help. Great experience and would definitely book again. Thank you for all of your kind words! We here at Cabins USA work hard to make sure each of our guests have the same great stay you enjoyed while vacationing in the Smokies. When you are ready to stay with us again, please mention you are a return guest for an additional discount. Thank you again for your review and thank you for choosing Cabins USA! I was very pleased with Cabins USA and it's staff. I failed to ask if this cabin had WiFi, however, I suggest that you add that amenity to your cabin choices for those of us who are older and forget to ask. I was very pleased at the cleanliness of the cabin. I will be using your company again. Thank you for taking the time to let us know about your recent stay in Hunting Hollow Haven! We here at Cabins USA work hard to make sure each of our guests have the same great stay you enjoyed while vacationing in the Smokies. When you are ready to stay with us again, please mention you are a return guest for an additional discount. Thank you again for your review and thank you for choosing Cabins USA! When we arrived, we Discovered the TV in the living room had been stolen. Spent our first evening dealing with the maintenance department and the police. No TV was brought to replace the 'missing' one. No one apologized or tried to compensate us for the inconvenience of dealing with the issue on the first night or the lack of a TV. Beds and pillows were very uncomfortable. The location was great. The cabin layout was nice for multiple families sharing the cabin. Great cabin, definitely in the woods no neighbors..peaceful. I am so happy to hear that you enjoyed your stay in Hunting Hollow Haven! When you are ready to stay with us again, please mention you are a return guest for an additional discount. Thank you again for your review and thank you for choosing Cabins USA! The cabin was awesome, could use updating (but still beautiful). The only downside was no wifi - but it was nice to escape the world for a minute anyways so it didn't damper our trip. The first night we found a scorpion (which was cool and scary at the same time - after that we didn't see anything else). Everyone was really nice, although I had to call several times to maintenance because the dish washer leaked and after two days of calling someone finally showed up. Also called trash pick up three times and they said they would send someone out to clean out our trash bin (it was full) but no one ever showed up. My only complaint is we had no dish towels! We loved the cabin! The game room was a hit!! Thank for taking the time to let us know about your recent stay in Hunting Hollow Haven! We here at Cabins USA work hard to make sure each of our guests have the best stay possible while vacationing in the Smokies. Your comments about the lack of dish towels have been forwarded to our housekeeping supervisor and she will be speaking with the cleaners to ensure all cabins are properly stocked. When you are ready to stay with us again, please mention you are a return guest for an additional discount. Thank you for choosing Cabins USA and we look forward to having you as our guest again! Love the express check-in. With the amount of traffic that is on the Parkway it was a blessing not to have to come by the office for the instructions. Thanks for a great weekend. we enjoyed 5 nights at Hunting Hollow Haven, and it was perfect. we were about 15-20 min from downtown Gatlinburg, just far enough to be removed from all the noise and traffic but close enough to enjoy the National Park and downtown. we did not have a mountain view but the area we were in was beautiful. only downfall on location was the residence at main road the turnoff was very messy and a little creepy but we were far enough up the hill to not worry about it. staff was only marked low b/c we did not have to deal with any staff at all. we did express check in and only spoke with someone to verify check out time. Hunting Hollow Haven was a beautiful cabin with just enough space for the 4 of us to get away from each other but small enough that we felt comfortable. Thank you for taking the time to let us know about your recent stay in Hunting Hollow Haven. We here at Cabins USA work hard to make sure each of our guests have the best stay possible while vacationing in the Smokies. When you are ready to stay with us again, please mention you are a return guest for an additional discount. Thank you for choosing Cabins USA and we look forward to having you as our guest again! We enjoyed our stay in Hunting Hollow Haven. The cabin was very clean on arrival. The check-in and check-out process was so easy and very convenient. We will definitely us Cabins USA for our next trip!! Thank you for all of your kind words! We here at Cabins USA work hard to make sure each of our guests have the same great stay you enjoyed while vacationing in the Smokies. When you are ready to stay with us again, please mention you are a return guest for an additional discount. Thank you again for your review and we look forward to having you as our guest again! Number 2 - They replaced the futon mattress in the loft. It's so thin, your back will kill you from sleeping on it. Number 3 - the hot tub cover didn't have a tear causing you to have to pull out white foam pieces every time you use the hot tub. Number 4- you could push other buttons on the microwave other than start and stop. Number 5 - If the remote control for the TV in the Living Room worked better. Number 6 - The light on the Range hood would work. Number 7- Lastly, the TV in the Main Floor Bedroom kept going out. I had to keep shutting it off and turning it back on every time it happened. Once you turned it back on, it would work fine. Other than these items, the cabin was great. I wish I could buy it, make the needed upgrades/repairs and rent it out myself. Checking in went smoothly, it was all done online. I have used CabinsUSA many years now, we travel to Pigeon Forge every year. I can't really think of any issues I have had that CabinsUSA did not take care of on their end right away. The only reason I scored the staff an 9 on this stay is because I did not have much interaction with them other than a long wait on the phone for checking out. Wonderful cabin. Our kids had a great time downstairs with the game room. Everything was clean. We had a few leaks from the upstairs bathroom and they were willing to send someone right out. The cabin had everything we needed. The road to the cabin was to bad considering we have had some scary roadways in the past with other cabins. Close by to Gatlinburg and Pigeon forge. Only a 20 min drive to either place. Would have liked to have wifi but we survived. The only complaint was the beds were a bit hard for out taste but otherwise we had a great time. Thank you for all of your kind words! Our maintenance department works hard to make sure that any issues our guests have are addressed as quickly as possible. I am also happy to report that the owner of this cabin has been working on updating the cabin. It has recently been remodeled from a 2 bedroom cabin to a 3 bedroom and they will be returning in April to continue to make updates. When you are ready to stay with us again, please mention you are a return guest for an additional discount. Thank you for choosing Cabins USA and we look forward to having you as our guest again! Thank you for taking the time to let us know about your recent stay in Hunting Hollow Haven! We here at Cabins USA work hard to make sure that each of our guests have the same great stay you enjoyed while vacationing in the Smokies. Your comments about the cleanliness of the cabin has been forwarded to our housekeeping supervisor and she will be speaking with the cleaners regarding that issue. When you are ready to stay with us again, please mention you are a return guest for an additional discount. Thank you for choosing Cabins USA and we look forward to having you as our guest again! The cabin was really awesome and location was in a fantastic place. Can go to Gatlinburg with ease or go to Sevierville and miss most of the traffic. The kitchen could use an update on a newer stove, the cooking pans need to be replaced and the upstairs mattress is in need of an upgrade (kids probably wouldn't mind) but my mother wasn't pleased. Overall I would still recommend the cabin and also renting from Cabins USA. We will be back next year and try a different cabin from Cabins USA. Awesome customer service at check in as well (you ladies were awesome!) and very helpful! See you guys in 2016! Thank you for taking the time to let us know about your recent stay in Hunting Hollow Lodge. We here at Cabins USA work hard to make sure that each of our guests have the same great stay you enjoyed while visiting the Smokies. Thank you for letting us know about the stove, pans and upstairs mattress. I am happy to report that since your review, the owner has made some upgrades to the cabin including a new king mattress in the upstairs bedroom. Thank you again for your review and thank you for choosing Cabins USA! I am so happy to hear that you enjoyed your stay in Hunting Hollow Haven! We here at Cabins USA work hard to make sure that each of our guests have the same great stay you enjoyed while vacationing in the Smokies. When you are ready to stay with again, please let our reservationists know you are a return guest for an additional discount. Thank you again for your review and thank you for choosing Cabins USA! The cabin was nice ,a little outdated , could use new cookware , the driveway was very narrow , but on the upside the 5 GRANDKIDS loved it , they didn't wanna leave . OVER ALL IT WAS NICE !! I am so happy to hear that you and your grandkids loved staying in Hunting Hollow Haven! Thank you for letting us know about the cookware in the cabin. Your comments have been forwarded on to our housekeeping department and they will be correcting that issue. Thank you again for your review and thank you for choosing Cabins USA! We had a wonderful time and enjoyed the cabin very much. It was centrally located and we used Google maps to get around. We were able to get anywhere within 20-30 minutes from the cabin to Gatlinburg, Pigeon Forge or even Sevierville. The only suggestion that I would make is about the outdoor furniture. Most of the furniture was very uncomfortable and needed outdoor cushions and an additional porch swing on the main level would be nice. Thank you for all of your kind words and I am happy to hear that you enjoyed your stay in Hunting Hollow Haven! We here at Cabins USA work hard to make sure that each of our guests have the same great stay you enjoyed while vacationing in the Smokies. Thank you for letting us know about the outdoor furniture. Your comments have been forwarded on to our Owner Liaisons and they will be speaking with the owner of the cabin. Thank you again for your review and we look forward to having you as our guest again! This cabin was great! Very clean, we felt at home. Only downside was narrow road leading to it, we just hoped we didn't meet a car on it. Overall, highly pleased! I am so happy to hear that you enjoyed your stay in Hunting Hollow Haven! We here at Cabins USA work hard to make sure that each of our guests have the same great experience you enjoyed while vacationing in the Smokies. Thank you again for your review and we look forward to having you as our guest again! Had an amazing time our cabin was great. Our only issue was there was no cutting board. But the cabin was beautiful we had a great time and the price was perfect couldn't get a hotel for the price of our 3 bedroom 3 bath with a HOT TUBE! to having you as our guest again! It is a great cabin in a good location. You are 10 minutes from gatlinburg and 15 minutes from pigeon forge. The cabin has all you need for the week. Express checkin is the best. The cabin was ready for our arrival when it was suppose to. Some of the pots and pans could be replaced and the fridge froze some of our food. One night the power went out and a quick phone call to the after hour maintenance resolved the issue ,which was out of cabins usa control. Its a great cabin and we would return. Thank you for all of your kind words! We here at Cabins USA work hard to make sure that each of our guest have the same great experience you did while vacationing in the Smokies. Our maintenance department works hard to ensure that each of our guests received prompt responses when they call in. When you are ready to stay with us again, please let our reservationists know you are a return guest for an additional discount. Thank you again for your review and we look forward to seeing you again soon! All in all my family enjoyed our stay. We loved how spacious it was and The cabin was very secluded and peaceful. Was disappointed by a few things. The 2 main issues were, the bed in the upper loft was slept in and the bedding was never changed and the sheets had ALOT of hair in them. By the time we decided to go to bed, it was too late to do laundry so that caused chaos. Also springs are coming through the mattress up there. The main lighting/ ceiling fan fixture in the kitchen/ living room did not work...it wasn't even hooked up to a switch. Made it very dark and hard to see when sitting at the kitchen table. Our air conditioning unit froze up second night we were there and even though it was about 10 something at night, a maintenance person was sent out thankfully but it turned out a compressor needed to be replaced which another person came out immedialty for. The frying pans REALLY need to be replaced! I think they are unhealthy at this point to use. Also the dishwasher was full of dirty dishes and broken glasses. Had to pick glass out of the bottom of it. Even with all said , I would come back again. I just think more attention to detail and some freshing up would help this cabin out. I would give the property 3 out of 5. The positives: If you are looking for a remote location this one fits the bill. Deep in the woods and you only see one other rooftop through the trees. The cabin was very clean and that always is huge for us so we were very thankful. The channel selection was also really good, more than I expected from a rental cabin. The negatives: No wi-fi or internet access .... this actually ended up being a big deal as we had two teenage girls with us. The showers are tiny ..... barely enough room to turn around and all of us are in good shape physically. The loft area was nice, but know going in that there is no insulation between the loft and the master bedroom so EVERY little noise is heard from above and below. Had a really hard time going to sleep until our girls in the loft finally fell asleep. The kitchen has most of what you would need, but the pans (as noted in another review) are in need of replacing. The TVs were fine, but think they could have been updated. In fact much of the furnishing could use a little updating. A couple of the remote controls were missing batteries ... no biggie, just a pain. And we have found it very helpful to have more instructions about the cabin than this cabin had. Pool table felt was torn and the air hockey and foosball tables also needed some repair/attention. And the strangest thing .... we could not find how to control the main room ceiling fan. We tried every switch in the house and also tried the pulls .... nothing. A huge mystery. Great weekend getaway! Throughly enjoyed the cabin. It is off of the main roads very secluded which we loved. Will visit again soon! Thank you for taking the time to let us know about your recent stay in Hunting Hallow Haven and I am so happy to hear that you enjoyed your stay. Whether you're looking for a cabin with a gorgeous mountain view or something with more privacy, our reservationists are always more than happy to help you find the perfect cabin. Thank you again for your review and we look forward to having you as our guest again! Needed a getaway from life's hustle and bustle. This cabin was the answer. We loved the layout. The loft area gave our teenager her own private space. The hot tub was very relaxing and therapeutic. The game room allowed us hours of entertainment. Friday, we didn't leave the cabin at all. When we arrived at our cabin there was a maintenance man checking the water. No big deal except he was rude and upset that we were allowed to check in. The only complaints were the pots and pans. They are old and rusted. I was hoping this had been fixed since it was mentioned in an earlier review. The toilets had rings around them as if the water had been sitting a while. We just chucked that up to maybe we were the first to stay there this year. A huge shout out to maintenance man, Timothy. We had a copperhead visit us and was coiled up about 6 feet from our front door. I called the office and they sent him out immediately. He took care of the issue and was super nice about it. We also had a bear visitor that night. We can definitely say both adventures added to our memories. We will definitely stay here again. I'll just bring my own pots and pans. We had a nice family time, very nice cabin I really liked the location, the only thing I did not like where the pan were very old and burnt. Thank you for your review. We are delighted that you family had a great time with us at Hunting Hollow Haven. We appreciate your feedback, and we will have the kitchenware inspected immediately. We hope that we will hear from you again very soon! The only thing we found that could be replaced was the hide-a-bed in the living room. The mattress really needs replaced, you could actually see the springs even before you laid down on it. We still managed and had a great time, everything else was great and was in a pretty location. Thank you for your review. We appreciate your feedback on your stay with us, and we will have the hide-a-bed looked at immediately. We hope that we will hear from you again soon. We loved our stay and give Hunting Hollow Haven two thumbs up! Everything was exactally as described so there were no hidden surprises. We will definitely return if we have a large group going again. Regardless, we will use Cabins USA again. Two words to begin- MOUNTAIN SCORPIONS. They exist, and we had one get into the washing machine. Luckily, he was dead before I found him. They sting, but are not deadly- good news! You must keep ALL drains plugged. So, right after you wash your hands- plug that drain closed! Bring aluminum foil for any drains that don't have a plug, and for the over-flow drain in the tub. A HUGE problem for us- the TV system blocks out any show that it deems inappropriate. We watch a weekly show called 'The Strain' it is rated "MA" so we could not watch it. (Even after calling the main office for support) So, if you want to stay here- make sure you set your DVR at home for any show that you don't want to miss! Other than the scorpion-stress and the blocked TV shows. (And- the ceiling fan/light unit in the main room being broken) It was a nice place. Could've slept four more people, in addition to our family of four. Game room was a BIG hit with the kids. We were able to pack lighter, since I could wash clothes there. Things you should bring: Aluminum foil, salt & pepper shakers, extra garbage bags and dishwasher tablets. Finding it the first day was difficult- directions were terrible and the driveway isn't marked well. (Actually, it's marked with two different names, and we read the wrong one and sailed on by. It was a 45 minute stressed out disaster) Hot tub worked well. The cabin was great! Not too far from all attractions! Kids had a blast and even didn't want to leave the cabin! My stay at the cabin was great. Everything was clean and the beds were really comfortable. My only grievances is the fridge would not stay closed for some reason and on our last night there our air conditioner cut out! We called the after hours number as soon as we discovered it and they never called back or came to fix it. It got pretty warm in the cabin, my son sweat all night and my husband didn't sleep well. Thank you for your review. We are delighted that you had a great time at Hunting Hollow Haven. We apologize for the inconvenience during your last night. We did have to call a vendor for the AC and it is now working. We hope that we will hear from you again soon. Great cabin to stay in especially if your looking for relaxation and quietness. Very clean and cozy! Only complaint is the cabin sleeps 8 but the tiny charcoal grill provided was not large enough to cook for 8 nor did it say anywhere that we needed charcoal. Not a biggie though, we managed fine. Thank you for your review. We are delighted you enjoyed your stay at Hunting Hollow Haven. We apologize if you were inconvenienced by the grill being charcoal. Many of the cabin owners have switched to charcoal/park grills due to safety. We apologize that it was not listed as a charcoal grill, but feel free to call us at any time regarding any questions that you may have about your cabin or your stay with us. We hope that we will be seeing you again soon. If you want a very secluded cabin in the mountains, this is the place for you. It is about 45 minutes to Pigeon forge and 30 minutes to Gatlinburg. You will travel through the Glades and it is very nice there, just a peaceful little drive and there are a ton of little old shops to visit. As we turned off the main road there is this not so nice shack and the owner has a ton of trash and "collectables" outside of his house, I really wanted to go feed his dog! The cabin has a nice driveway but it is a little hard to turn around in if you have a larger vehicle. The cabin itself was fairly clean and well stocked with all the amenities that we needed for the week. I really liked to layout of the cabin and it is really spacious for a family of 4 like us, but felt like a few more people would have been comfortable as well. The upstairs shower in the loft area has a leak so water was leaking to the middle level bathroom every time my daughter took a shower. The Master bedroom had some stains on the carpet but it wasn't incredibly bad. The televisions in the bedrooms could be updated and the loft bedroom has no television. The deck was super nice because it overlooks a hill of trees. you can't necessarily see mountains but it has a nice view. There is some trash and metal around on the ground, I wish the grounds keepers would pick this stuff up because in some spots I didn't want my children to walk around. The pool table was fairly nice but had some wear and tear on the felt and one of the side pockets was ripped and the balls just fell right out! All in all this is a good cabin if you can look past the minor faults. I do not think we will get such an excluded cabin again because it did take a long time to get to where we wanted to go. I did however like the fact that neighbors were not that close except for one and it was vacant the whole week. Please visit the 8 mile loop that starts at the stoplight 8 in Gatlinburg and look at the old house of one of the original settlers. Also if you would like to do zip lining, go to Legacy Mountain, it is very close to the cabin and the people are amazing! I hope this helped! We came for Spring Break... the cabin was wonderful. It had everything we needed and so much more. My kids loved the game room!!! I actually had trouble getting them to get out of the cabin to see the sights. They were able to have their space and I was able to have my own "quite" space. Thank you for making our trip wonderful and memorable!!! The cabin was beautiful. We couldn't have asked for a nicer cabin. The road to the cabin was horrible. It was steep, muddy and narrow. We were there in February and it snowed some every day we were there. Had I not had a four wheel drive truck, there were days when we never would have been able to make it up to the cabin. The parking area around the cabin is tiny. We had to back all the way out the long drive to get out because there was not enough room to turn a truck around. Overall, we were very pleased with our experience there. Thank you for your review Bill. We are delighted that you had an overall great experience with us at Hunting Hollow Haven. We do recommend a four wheel drive to most of our cabins during the fall and winter. We hope to see you again in the future. Loved it. It was nice to feel so far away from everything but still be only 20 minutes out. No problems with anything, It was clean, comfortable, and quiet. I'd like to live in it year round. If I get back to the area, I will request this cabin again. This is a very nice and private cabin and was just the getaway we were looking for. We really enjoyed the cabin, after we got the air conditioner fixed. The bed downstairs was a little to hard. But my husband liked it. The directions was really long, but we found a short cut. The road going up the hill needed work. The hot tub had to much calorine. Over all we really enjoyed it. We would stay in it again if its not snowing. Thank you for choosing Cabins USA, and taking the time to write a review. We are delighted you enjoyed your stay with us at Hunting Hollow Haven. The private road to the cabin has since been repaired. We do apologize for the inconveniences you encounter during your stay; however, we are happy our maintenance staff was able to take care of the air conditioning. We look forward to seeing you again for your next visit to the Smokies. the place was great the only bad thing was the hot tub smelled like meldew I think it was the cover. we loved our stay just wish we would have been there longer. very cozy and we loved how private it was. We absolutely loved the place and had no complaints! I read the reviews before we left and any of the complaints were very petty and generally untrue! The road up to the house is a typical small, rocky, mountain road. Just pay attention, go slow, and you will be fine. The house is extremely secluded if that is what you are looking for! Wish we could have had a bit more of a mountain "overlook" view, but that definitely didn't affect the enjoyment of our vacation at all! It is beautiful with a ton of space and entertainment! Thank You!!! Thank you for choosing Cabins USA. We are very happy to hear that you had no complaints and had a wonderful experience with us at Hunting Hollow Haven. We do apologize for the inconvenience of the view. We hope to see you again soon for your next visit to the Great Smoky Mountains. cabin was great everyone had plenty of space grandkids loved the basement play room the directions to find the cabin were the worst directions i have ever had what sould have been 1/2 hour drive from pigonforge office turned into two 1/2 hour pain in the --- !!! Thank you for choosing Cabins USA. We are delighted that your enjoyed your stay with us at Hunting Hollow Haven; However, we do apologize for the inconvenience you experienced during your stay. We are always available by phone if you have any questions regarding the drive to any of the cabins. We hope that you will give us another chance I on your future trip in the Smokies. I loved this property! Getting up there was interesting but the home and the amenities were wonderful!!! We would love to come back again! Hunting Hollow was a beautiful cabin. It's located just far enough away from the crowds but close enough to get you to town to enjoy any activities within minutes. I did not give the property a 10 only for the fact that there is no property. If you have children that want to play outdoors they couldn't. Your literally on the side of the mountain. This did not affect my vacation as we were to busy hiking in the park or enjoying downtown all day. The cabin is very spacious and has plenty to do inside to occupy children and adults of all ages. The only negative I would say is the road to the cabin could defiantly use some repairs. All in all I would definitely recommend and stay in this cabin again! Thank you for choosing Cabins USA Gatlinburg. We are so happy to see that you enjoyed your stay in Hunting Hollow Haven. We hope that you will stay with us again soon. The only problem we found with the house was it had a leak in the bottom room on the main floor over the sink. It only leaked when someone took a shower in the bathroom on the top floor. Comfort got a 6 because of the bed on the bottom floor was not to comfortable. Thank you for choosing Cabins USA Gatlinburg. We are happy that all in all you enjoyed your stay. We do ask all our guest upon check in that if you encounter any problems at your cabin to please make us aware of them so that we are given the chance to correct the issues. We do not show where anyone called us with any problems during your stay. We do hope that you will give us another chance in the future to provide you with a wonderful cabin stay. My family and I had a great time at this cabin. The cabin is very spacious and well decorated. The kids really enjoyed the game room down stairs. It is convenient to both Pigeon Forge and Gatlinburg. The only complaint about the entire trip was the road situation. The dirt road leading to the cabin is a very steep incline. We received some rain while we were there. It was very interesting getting to and from town after some rainfall. I would recommend a four wheel drive truck in these situations. A cute and cozy cabin and tastefully decorated! it's biggest drawback was the road leading up to it...we were expecting an unpaved road but not one that had a huge groove in that if you aren't paying attention you could get a wheel stuck or bottom out. The staff was super great, we had an issue with the fireplace and they were out later the same day and had it fixed. Thank you for choosing Cabins USA Gatlinburg. We are so happy to see that you enjoyed your stay in Hunting Hollow Haven. The Smoky Mountain area is beautiful and along with that we do have some mountain roads that as noted in our policies will require four wheel drive. This particular small stretch of road that actually takes you to the cabin from the main road is privately owned and not city maintained. We do apologize for any inconvenience you may have encountered and we hope that you will stay with us again soon. The kitchen is pretty marginal if you plan to cook all your meals. There was only one dish towel, scant trash bags, dull knives. There were no staples at all such as salt, pepper, oil, spices, sugar, etc which I have always found at previous VRBO's. The space was good and the game room great. Very quiet and relaxing listening to the birds from the porch in the morning. We enjoyed the hot tub. The front door lock doesn't open consistently unless you push down hard on the knob to release the bolt. It would be nice to have a gas grill instead of just the charcoal grill. Overall a good stay and worked well for 2 couples and three kids. Thank you for choosing Cabins USA Gatlinburg. We are so happy to see that you enjoyed your stay in Hunting Hollow Haven. As listed in our policies we only supply a starter set of toilet paper, paper towels, bath soaps, dish detergent, and trash bags. We also supply the linens that you will need while staying in the cabin. Please know that during your future stays you may contact us here in the office on any issue at the cabin and we will go out of our way to make sure your stay is one to remember. We hope to see you again soon. Road to cabin needs to be worked on badly. The cabin was very nice. There were only a few quirks: No fan in the bedroom on the first floor, the loft needed a TV and when sleeping in the bedroom on the first floor, the floor from the loft is the ceiling and everytime someone moved on the bed or walked, the sound was very prominant. The worst thing was the road getting to the cabin. Very bumpy, washed out, we were scared the day it rained that it would wash completely out. Needs road improvments and a sign at that recognizes the road to turn on to get to the cabin. Current one is so small if checking in at night (as we did) it was very hard to find. Also no cell or phone service in the cabin. Great cabin - we loved the air hockey and hot tub especially. The futon and basement bed were a bit soft but otherwise everything was very comfortable and we found everything we needed. Thank you for choosing Cabins USA Gatlinburg. We are so happy to see that you enjoyed your stay in Hunting Hollow Haven. Thank you for the positive comments. We hope to see you again soon. This particular cabin was nice although it was definitely off the beaten path. It had some cleanliness issues. There was trash on the grounds property and inside, the bathrooms could have used a little more attention to the details...corners, hair in tub, etc. Also, the 3rd floor shower and the basement shower both would just cut out in the middle of the shower or the water would switch from hot to cold to hot just randomly. The living room furniture was less than comfortable...both couch and love seat seemed old and worn. The mattress downstairs was sunk in the middle and not the best. It served our purpose and our stay was not entirely uncomfortable but I did sort of feel like I should clean before using anying. Even the carpets seemed to need a good cleaning. The staff and reservation process was excellent however. Thank you. This cabin is off the beaten path so be careful driving up the mountain road to the cabin, it's very narrow. The cabin was clean and well furnished however, Only one pool que. The master bedroom has a king size bed that was very comfortable and the loft has a queen. Overall, nice place. Thanks. Thank you for choosing Cabins USA Gatlinburg. We are happy to see that you enjoyed your stay in Hunting Hollow Haven. We apologize that you only had one pool stick. We do ask at check in if you have any problems during your stay to make us aware so that we may correct it for you. We do hope that you will keep us in mind for your future stays in the Gatlinburg area. Thank you for choosing Cabins USA Gatlinburg. We are happy to see that you enjoyed your stay in Hunting Hollow Haven. We hope that you will visit us again soon. Very nice, comfortable and clean. Service was great, and price was very reasonable. Fireplace control needs to be checked...we couldn't turn it off a couple of times. Thank you for choosing Cabins USA Gatlinburg. We are happy that you enjoyed your stay in Hunting Hollow Haven. We hope that you will visit us again soon. Thank you for staying with Cabins USA Gatlinburg. We are happy to see that you enjoyed your stay in Hunting Hollow Haven. We hope to see you again soon. We loved the cabin but it needs abit of updates on equipment etc. More large plates, we had 6 adults and 1 child. There were 8 plates but that doesn't leave enough to serve the meal on we didn't find any serving kind of tray to use instead. There were only salad forks except for 3 regular forks which is kinda a pain. No blender which was supposed to be there. Used the mixer to make pina colada's which didn't work to well, made them so-so. Also it could use a bigger grill, it was difficult to cook for 8 on. Only one pool cue, the air hockey table only 1 puck worked. Biggest real complaint was that the downstairs mattress needs replaced. It sagged to the middle which wasn't comfortable as you ended up there which is okay if you want to snuggle! Problem was my husband and son used that bed, while my daughter and I used the King which was soooo comfortable. I gave a lower than 5 on check in only because we stayed at an American Patriots cabin in May. With their check in you can mail all paperwork to them in advance and call with your ID number before you check in and get the code over the phone so you don't need to go to the office at all. This is more convenient when different parties are arriving at different times. This cabin was the same as my brother from NC and us from KY were sharing the cabin. On cleanliness it was very clean except for cobwebs. It also would have been nice with some Christmas decorations up. We did love the cabin and the location. Everything was okay, we just made due with what we had. Totally realize that with all the renters things wear out and need replaced, figured with toward the end of season that is what we get. What a great rate, location, and amenities that came with the cabin. We were not expecting such a nice cabin with the amenities. Had a wonderful time, the cabin was clean and nicely decorated. Very enjoyable. The view is nice also even though it is in the woods, you feel secluded. Love it! Thanks. This was our first cabin that we have ever rented and we will be back again..
was great and we are very satisfied.. Thanks.. Thank you for staying with Cabins USA Gatlinburg. We are so happy to see that you enjoyed your stay in Hunting Hollow Haven. We hope that you will stay with us again on your next trip to Gatlinburg. This cabin was a great place to stay. We were on motorcycles and the road was not too bad, but it is gravel. The only thing it needs is some decent cookware in the kitchen. Really enjoyed our stay and by the way, the neighbor's cats name is Jesse. He is friendly, too. Great place, great time. Cabins USA Gatlinburg has friendly and very nice staff also. Look forward to staying with you again. Thank you for staying with Cabins USA Gatlinburg. We are happy to see that you enjoyed your stay in Hunting Hollow Haven. Since your visit we have put new cookware in the cabin. We hope that you will stay with us again on your next visit to the Gatlinburg area. Hunting Hollow Haven was an amazing cabin! We could not have asked for a better cabin. With the exception of needing a few kitchen more items, we had everything we needed, plus more! The quietness of the back decks and the relaxation of the hot tub, as well as the games in the basement, made it very hard to return to our busy schedules. The staff at USA Cabins made our whole experience wonderful. We will be calling again in the spring so we can enjoy another relaxing few days. Thank you for choosing Cabins USA Gatlinburg. We are so pleased to see that you enjoyed your stay in Hunting Hollow Haven. We hope that you will keep us in mind for your future visits to the Gatlinburg area.